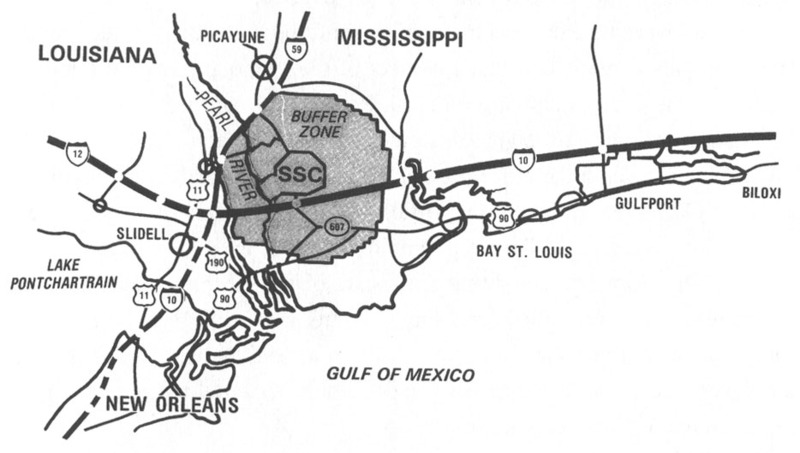 This current Stennis Space Center directional map shows the main complex or "fee area", the buffer zone, and the center's geographical relationship to the surrounding LA and MS areas. Interstate Highways 10 and 59, which were not built when the site was selected in 1961, are clearly shown in this map. 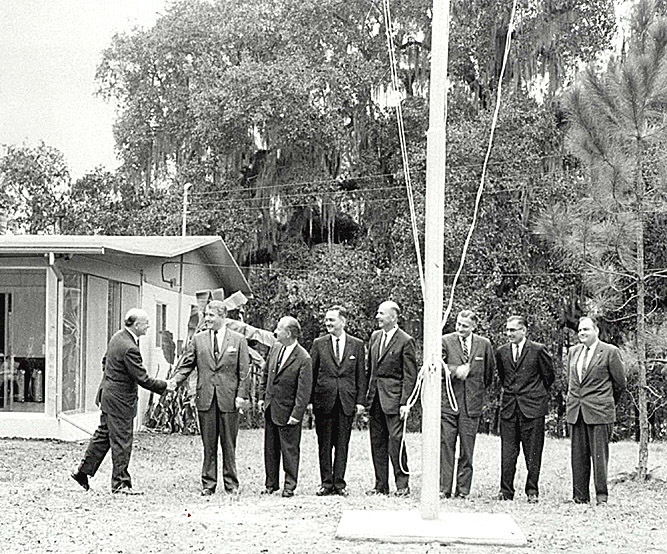 Government officials of the NASA George C. Marshall Space Flight Center (MSFC) raise the American flag for the first time in front of the Rouchon House in 1962 at the Mississippi Test Operations, denoting NASA's presence in south Mississippi. Pictured, from left, are: Bart Slattery, public affairs officer; Dr. Werhner von Braun, MSFC director; Capt. William Fortune, MTO first site manager; Dr. George Constan, Michoud Assembly Facility (MAF) manager; Dr. Oswald Lange, chief, Saturn Program Office; Dr. Hermann Weidner, chief, Structures and Mechanics Laboratory; Mr. Karl Heimburg, director, Test Laboratory; and Dan Driscoll, Test Laboratory. (SSC-97-031). 1. Historical Division, "The History of the U.S. Army Corps of Engineers," Essayons (Washington, DC: U.S. Army Corps of Engineers EP-360-1-22, 1991), pp. 1-7. 2. NASA News Release, 25 October 1961, Stennis Space Center Historical Records Collection at Stennis Space Center, MS (henceforth referred to as SSCHRC). 3. Ad Hoc Site Selection Committee, "Launch Vehicle Test Site Evaluation," p. 67, SSCHRC. 4. "Big Moon Shot Test Job for Mobile Engineers," The Mobile (AL) Press-Register (henceforth referred to as The Mobile Press-Register), 29 October 1961. 5. Bob Torgerson, interview by Mack Herring, Bay St. Louis, MS, 8 January 1995, notes, SSCHRC. 6. "Big Moon Shot Test Job For Mobile Engineers," The Mobile Register, 29 October 1961. 7. C.L.H. "Horton" Webb, interview by Mack Herring, 10 October 1994, notes, SSCHRC. 8. Leyln Nybo, interview by Mack Herring, Bay St. Louis, MS, 12 January 1995, notes, SSCHRC; Director's Files, "Launch Vehicle Test Site Evaluation," nd., SSCHRC. 9. "Big Moon Shot Test Job for Mobile Engineers," The Mobile Press-Register, 29 October 1961. 10. U.S. Army Corps of Engineers, Mobile District, "Information Concerning Land Acquisition Program for NASA Centralized Testing Site, Mississippi and Louisiana," 23 November 1961, SSCHRC. 11. Ibid. ; For further information regarding the moving of the cemeteries, see "MSFC/NASA Seek To Save MTF Cemeteries," Picayune (MS) Item (henceforth referred to as the Picayune Item), 31 January 1963. 12. "NASA Officials Visit Here," The Hancock County (MS) Eagle, 14 December 1961. 13. "Moore to Get Land for Missile Testing Facility," The (Biloxi/Gulfport, MS) Daily Herald (henceforth referred to as The Daily Herald), 12 December 61. 14. William R. Matkin, interview by Dr. Charles Bolton, SSC, MS, Mississippi Oral History Program, University of Southern Mississippi, vol. 393, 4 December 1991, SSCHRC. 15. "Watch for Speculators," Rural Electric News, Mississippi Edition, December 1961, p. 9, SSCHRC. ; William R. Matkin, interview by Mack Herring, Pass Christian, MS, 14 January 1995, notes, SSCHRC. 16. "600 Beautiful Lots," The (New Orleans, LA) Times-Picayune (henceforth referred to as The Times-Picayune), 27 November 1962. 18. Mobile District Corps of Engineers, "Mississippi Test Facility Real Estate Planning Report," 12 January 1962, SSCHRC. 19. Ibid. ; Jerry Hlass, interview by Mack Herring, 27 February 1996, notes, SSCHRC. According to Mr. Jerry Hlass, who at the time of the land acquisition was the NASA Headquarters person for the construction of the MTF, "The total cost that NASA paid for the land including the Administrative cost by the Corps of Engineers totalled $21.5 million for both the Fee Area and the Buffer Zone." 20. "First Option Signed," The (Bay St. Louis, MS) Sea Coast Echo (henceforth referred to as The Sea Coast Echo), 19 April 1962. 21. "Mrs. Kellar 1st to Sell," The Sea Coast Echo, 3 May 1962. 22. "Land Owners Body Formed," The Sea Coast Echo, 24 May 1962. For further information, see "Property Owners Report Concern By Senator Stennis," Picayune Item, 8 February 1963. 23. Editorial, The Sea Coast Echo, 24 May 1962. 24. Editorial, The Hancock County (MS) Eagle, 31 May 1962; Editorial, Picayune Item, 7 June 1962. 25. "Full, Adequate, Just," Picayune Item, 17 May 1962; "Senator Stennis Interested In Test Zone Prices," Picayune Item, 24 May 1962; "Stennis, Colmer Co-operate," The Hancock County (MS) Eagle, 26 July 1962. 26. "Hancock Landowners Complain of NASA Offers," The Daily Herald, 12 May 1962. 27. "Stennis Says Moving Expenses Assured," The Hancock County MS) Eagle, 2 August 1962; "Government to Refund Expenses of Moving Incurred by Landowners," The Hancock County (MS) Eagle, 15 November 1962. 28. "Senator Stennis Announces New Policy for Buffer Zone," Picayune Item, 6 September 1962; "Senator Stennis Announces New Policy," The Hancock County (MS) Eagle, 6 September 1962. 29. "Gainesville Gets Another 60 Days to Move," Picayune Item, 21 June 1962. 31. "Houses In Test Area May Be Moved Along Highways," Picayune Item, 24 May 1962; "Biggest Housemoving Project In History Of State Coming In MTO," Picayune Item, 14 February 1963; Pauline Whitehead, interview by Mack Herring, Hancock County, MS, 26 August 1994, notes, SSCHRC. 32. "International Paper Signs Pact To Sell Land To NASA," The Sea Coast Echo, 25 October 1962. 33. "Hundreds Jam Gainesville To Say Last Goodbyes To Town," Picayune Item, 30 August 1962. 34. "Shorty's Place Might Become Engineers' Base," Picayune Item, 26 July 1962; Mrs. Elwood Andrews, interview by Mack Herring, Picayune, MS, 16 January 1995, notes, SSCHRC. Electric power became scarce and disruptions common in the last days with most of the Coast Electric Power Association's customers moving out. 35. "Last Families Leave Gainesville as Government Technicians Move in to Launch Great Saturn Job," Picayune Item, 1 October 1962. 36. "Television Tells Story of Ending for Gainesville," Picayune Item, 17 January 1963. 37. Robert C. Seamans, Jr., to Harry H. Gorman, 10 December 1961, SSCHRC. See also MSFC, Management Manual, "Charter, Mississippi Test Operations," 10 December 1963, SSCHRC. 38. For transcript of conversation during which von Braun offered Fortune the position as the MTO's first facility manager, see Daily Journal of Werhner von Braun, 1962, "Telephone Conversation Dr. von Braun/ Captain Fortune" 2 February 1962, SSCHRC; MSFC Biographical Sketch, "William C. Fortune Manager of MTF," 1 November 1962, SSCHRC. 39. Leo Seal, Jr., interview by Mack Herring, Gulfport, MS, 27 September 1994, notes, SSCHRC; Roy Baxter, interview by Mack Herring, 5 January 1995, notes, SSCHRC. 40. "Von Braun Here, Ups NASA Flag," The Sea Coast Echo, 21 November 1962; "America's Renowned Space Chief and Aides Inaugurate NASA Test Facility Headquarters," Picayune Item, 22 November 1962; Daily Journal of Werhner von Braun, 1962 "Von Braun Itinerary" 12-20 November 1962, SSCHRC; and "NASA's Office In Charge of Woman With Local Kin," Picayune Item, 21 November 1962. 41. "Countdown at MTF," The Sea Coast Echo, 21 November 1962. 42. MSFC Press Release, 31 October 1962; "Weather, Sound Tests," The Sea Coast Echo, 27 September 1962. For good discussion of acoustic facility work at the MTO, see Lee Paul, interview by Steven Patterson, Bay St. Louis, MS, Mississippi Oral History Program, University of Southern Mississippi, vol. 393, 4 December 1991, SSCHRC. 43. Baxter, interview by Herring; "Buffer Property Owners Will Discuss Problems At Logtown," Picayune Item, 25 April 1962; Editorial, "Owners Act Restrained," Picayune Item, 31 May 1962. 44. "Roberson Sites Sold for $20,000 To Government," Picayune Item, 31 May 1962; "Star Route Farm Easement Brings $370,000," Picayune Item, 22 August 1963. 45. "Parade Rest At Napoleon Will Live As Beautiful Garden For Tourists," Picayune Item, 19 March 1964. Author attended the social gathering held at Parade Rest in honor of the senator during a visit that Stennis made to the area in the spring of 1963. 46. "Logtown PO End Noted," The Sea Coast Echo, 30 September 1963; and NASA-MTF Press Release, 30 September 1963, SSCHRC. 47. Baxter, interview by Herring; Ronald Bailey, "Moon Race Blots Out a Town," Life Magazine, 26 September 1964, p. 4.